Volga-Dnepr Airlines has completed the first delivery of satellites for the OneWeb constellation project in cooperation Bolloré Logistics. 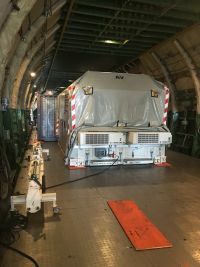 One of the airline’s An-124-100 freighters delivered six satellites from Toulouse, France, to Cayenne in French Guiana in two special containers weighing about 30 tonnes. The first satellite launch is scheduled for the middle of February.